Is Your Fouled Heat Exchanger Costing You? | Heat Exchangers Is Your Fouled Heat Exchanger Costing You? Fouling is the deposition and accumulation of undesirable materials such as scale, algae, suspended solids and insoluble salts on the internal or external surfaces of processing equipment, such as heat exchangers. Heat Exchangers are process equipment in which heat is continuously transferred from a hot to a cold fluid directly through a heat transfer surface that separates the two fluids, such as a plate or tube. 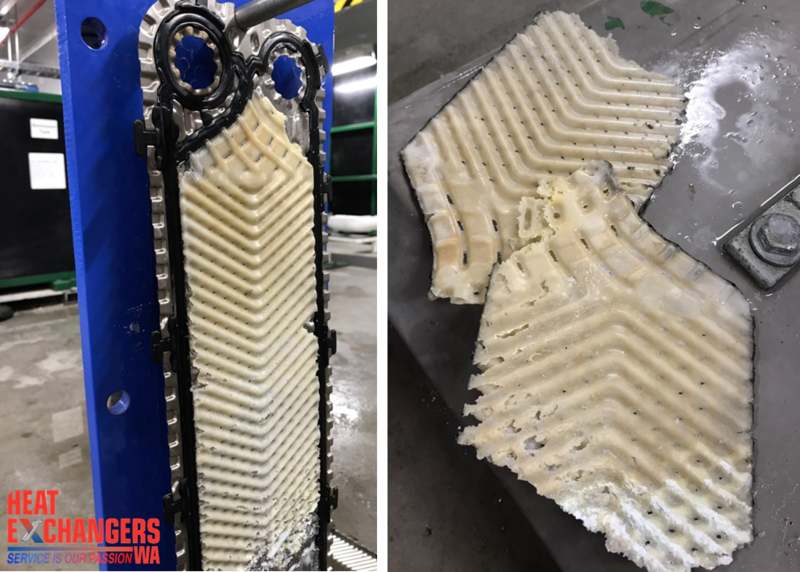 The accumulation of this fouled material causes a decrease in the thermal conductivity of the heat transfer surface, leading to a reduction in the performance of the heat exchanger. This decreased performance is typically magnified within a plate heat exchangers due to its reliance on the thin plate walls to maintain the highly efficient heat transfer. As a result, the presence of fouling on heat exchangers can have a significant negative impact on the operational efficiency and energy consumption costs of the processing plant. Additionally, processing plant production losses can occur due to a fouled heat exchanger causing an unplanned shutdown. 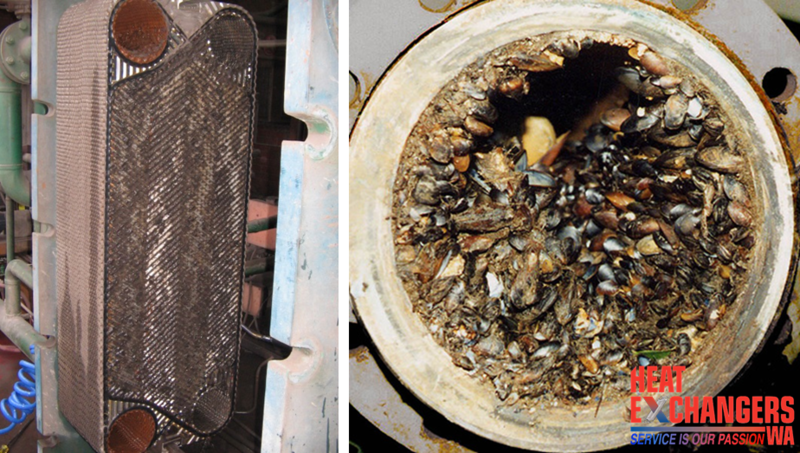 Increased costs can occur if extra fuel burning in furnaces or boilers is needed to overcome the effects of fouling. Garrett-Price et al. calculated that 1-5% of the energy consumed by the industrial sector is used to overcome fouling. The main contributor to fouling costs is due to planned and unplanned shut-downs with possible production losses. The one day shutdown of a 1300 MW power plant results in roughly US$500,000 lost production costs. Comparatively, the shut-down production losses for a large oil refinery are approximated as US$1.5 million per day. Combining the design, energy consumption, production losses and maintenance costs the total fouling impact upon the Australia and NZ industry is estimated at US$81 million per year (Muller-Steinhagen 2000). Particulate fouling is caused by suspended solids such as mud, silt, sand or other particles within the fluid that ‘cling’ to the heat transfer surface. This type of fouling can be removed relatively easily by high pressure washing or scrubbing. Depending on the application, cleaning-in-place (CIP) chemical treatment can be used if opening the heat exchanger is not permissible or frequent maintenance is required. CIP relies on the dissolution of the contaminant by the chemicals used. This requires knowledge of the type of contaminant and the selection of the most appropriate chemicals, keeping in mind that these chemicals must be compatible with the process equipment construction materials. CIP also relies on the chemical coming in contact with the contaminant. If some of the flow paths are blocked the chemicals cannot come in contact with contaminant in those areas. In this case channelling will occur and the only areas cleaned will be pre-existing clean channels. Furthermore, CIP requires effective isolation points and connections to be provided on the piping. Hence, opening the heat exchanger and cleaning is the most effective and guaranteed way of removing particulate fouling. Biological Fouling occurs when living matter grows on the heat transfer surfaces. In many cases, re-circulating cooling systems promote the growth of microorganisms. Biological fouling often presents as a dark green to brownish ‘slime’ on the surface of the plate such as algae, fungi or bacteria. Cold water is typically available from natural sources (such as rivers, bores or seawater) which contain macrobial species (eg. Clams, barnacles, vegetation) that can grow within heat exchangers, promoted by the optimum heated temperatures. This type of fouling is best controlled via quality water treatment at the cooling tower with chemicals such as biocides. However, these chemicals only inhibit biological fouling and will not remove material already adhering to the surface. Additionally, if the water source is used directly biological fouling cannot be prevented, requiring the heat exchanger to be opened for cleaning. Scaling is caused by inorganic salts in the heat exchanger that are known as ‘reverse soluble’, meaning that with increased temperature the salts become less soluble in water. Scaling occurs at high temperatures depositing a mineral film on the warm plate surface, increasing the pressure drop and preventing efficient heat transfer. The most common type of scaling is due to the precipitation of either calcium carbonate (lime) or calcium sulphate (gypsum). Unfortunately, scale is very difficult to remove via high pressure washing or scrubbing. Similar to particulate fouling, CIP can be used as a preventative maintenance procedure, however, the risks of flow channelling and the need for specialised piping make this a less preferred method of cleaning. As a result, static acid bath cleaning is preferentially utilised to dissolve scale and remove from the plate surface. Müller-Steinhagen, H. (2000). 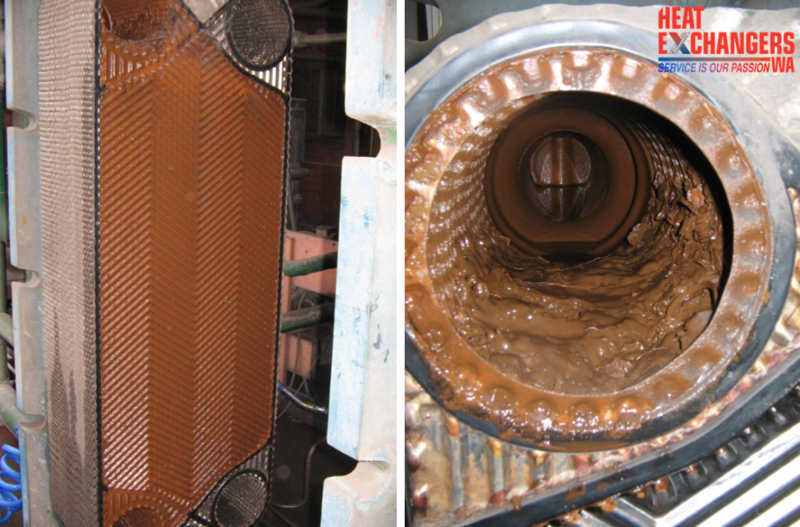 Handbook heat exchanger fouling – mitigation and cleaning technologies. IChemE. Garrett – Price, B. (1985). Fouling of heat exchangers. Park Ridge – N.J: Noyes Publications. Good article. Informative and helpful. Well done.